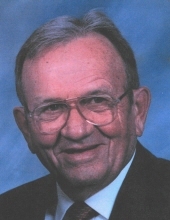 Robert Randall Sullins, 90 of Casey passed away on Friday, March 15, 2019 at The New Homestead in Guthrie Center. Visitation will be from 3-7 PM on Tuesday, March 19th at the Johnson Family Funeral Home in Stuart. Family will be present at visitation from 5-7 PM. Funeral service will be held at 11 AM on Wednesday, March 20th at the Casey United Methodist Church. Burial will be at Oakwood Cemetery in Casey. Memorial contributions may be directed to the Casey Fire Department, Casey Public Library or the Casey United Methodist Church and may be sent in care of Johnson Family Funeral Home, PO Box 246, Stuart, IA 50250. Online condolences may be left at www.johnsonfamilyfuneralhome.com. Bob was born the son of Harve H. and Anna Rachael (Hall) Sullins on July 17, 1928 in Trenton, Missouri. He went to school in Eldon, Iowa, Trenton, Missouri and he moved to Maple Hill, Kansas in 1937 where he graduated in 1946. He started his training by his father on the Rock Island Railroad during the summer when he was 16. After graduation he started full-time on the Rock Island Railroad. While working in Seymour, Iowa in 1947 he met the love of his life, Margaret Cole. They were married September 7, 1948. After their marriage he worked in Missouri, Kansas, Colorado and Iowa. After ten years of moving where the railroad sent him, he had seniority to secure a Signal Maintainer position in Casey, Iowa. He was able to stay in Casey working for the Rock Island and Chicago Northwestern Railroads until he retired in 1989 with 44 years of service. In July 2018 he moved to The New Homestead Nursing Home. He was a member of the Casey United Methodist Church, a member of the Order of the Eastern Star, Masonic Lodge of Casey, the Shriners, and the Casey Fire Department. Bob enjoyed hunting with his dogs, fishing, woodworking, cooking, reading, playing cards, his electric train collection, and gardening. He was happiest working in his yard mowing and trimming! He loved watching Iowa State Basketball and he especially enjoyed March Madness! He would get his list of teams that were listed and then spend time mulling over his choices! He would watch every game. He loved traveling with his wife and spending time with his family and friends. He always had a joke or story to tell and made everyone around him smile. He truly loved the Casey Community and never wanted to live anywhere else. Bob is survived by his wife of 70 years, Margaret; daughters: Ruth Crew, Roberta Sullins, Jan (Randy) Crawford, and Carol (Chris) Nelson; Eleven grandchildren: Jennifer (Bryan) Healey, James Donnellan, Jeremy Donnellan, Summer (Justin) Snyder, Patrick Callaway, Blake (Angie) Crawford, Justin (Kate) Crawford, Jill (Josh) Blacksmith, Gabriel (Rebekah) Emgarten, Brooks Emgarten, and Chase (Tina) Emgarten; and 24 Great-Grandchildren. He was preceded in death by his parents; sister, Harriet Conrad and brother-in-law, Jack; sister, Margaret Goldsmith and brother-in-law, Richard; and brother, Charles Sullins. To send flowers or a remembrance gift to the family of Robert Randall Sullins, please visit our Tribute Store. Family will be present from 5-7 P.M. Luncheon will follow the burial service. "Email Address" would like to share the life celebration of Robert Randall Sullins. Click on the "link" to go to share a favorite memory or leave a condolence message for the family.